ELIZABETH GOODHIND was born in Dartford, Kent, England on November 10, 1855. She was also known as "Lizzie." 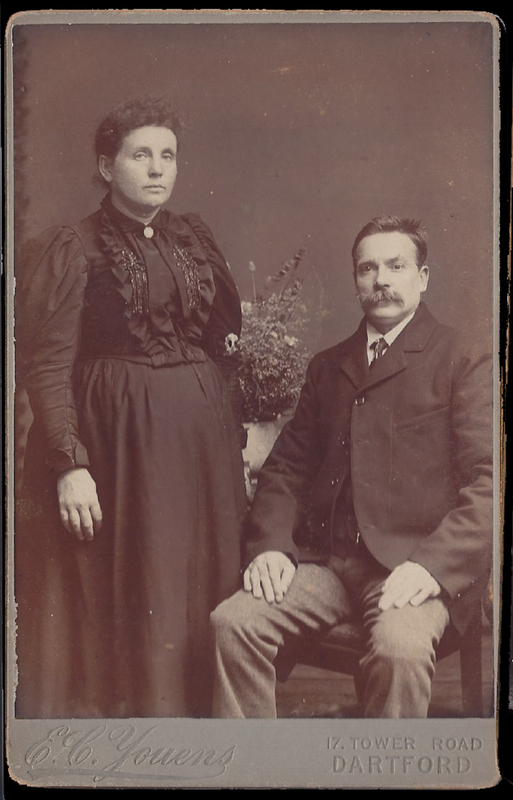 On August 1, 1875, at the Parish Church in Crayford, Kent, she married WALTER FREDERICK MARTIN, (born November 21, 1852 in Dartford, he died there on April 3, 1903 at the age of 50) son of John and Emma (Buckland) Martin. Elizabeth passed away on April 18, 1949 at Dartford at the age of 93. 1. DOROTHY KATE MAGRATH was born in October 17, 1900 in Dartford. 2. NELLIE LUCY MAGRATH was born in 1902 in Dartford. 3. HARRY WALTER MAGRATH was born in July 27, 1905 in Dartford. He married AMELIA A. ? (born September 27, 1904). 1. LILIAN LUCY WIGGINS was born January 5, 1902 in Brighton. She married CHARLES R. TILLEY (born November 30, 1903) there in 1929. She died in 1973 at Waltham Forest, London. She was 71 years old. 2. CHARLES ALBERT WIGGINS was born in October 17, 1904 in Brighton. He died in Hove, Sussex in 1972. He was 68 years old. C. WALTER MARTIN was born in Dartford about 1879. He died there on December 24, 1952 at the age of 73. He never married. 1. HARRY MARTIN was born October 16, 1903 in Dartford. He was more commonly known as "Ala" within the family. He was an Engineer and never married. He died on November 4, 1936 at home in Wilmington, Kent at the age of 33.
a. JOHN WILLIAM MARTIN was born on January 14, 1931 in Erith, Kent. He was a Principal Scientific Officer at the Ministry of Defense. John died on October 17, 1966 in The Royal Marsdon Hospital, Chelsea, London. He was 35 years old. John married BETTY ANN BROWN, born December 20, 1929 in Hornsey, Middlesex. She died on May 10, 2010 in Bath, Somerset at the age of 80. Two daughters. 3. FREDERICK MARTIN was born on May 8, 1917 in Dartford. Frederick was a printer. He married IRENE MABEL DIMOND in September 1952. He died on May 31, 2008 at the age of 91. The couple had no children. 4. Twin TOM MARTIN was born on February 11, 1923. Tom was a carpenter. He died on April 15, 2009 in Dartford. Tom was 86 years old. Never married. 5. Twin GRACE MARTIN was born on February 11, 1923. Grace ran the store with her mother and later on her own. She died on March 3, 2003 at the age of 80. Never married. 1. MABEL ANNIE BEX was born in 1902 in Dartford, Kent. She married REGINALD BETTERIDGE (born January 3, 1903 in London). Reginald died at Grimsby in 1978 at the age of 78; Mabel died in Lincolnshire in November of 2004 at the age of 102.
a. HUGH O'NEILL was born May 9, 1935. 3. DENNIS BEX was born March 21, 1908 in Dartford, Kent. 1. LUCY ELIZABETH MARTIN was born February 10, 1911 in Dartford. 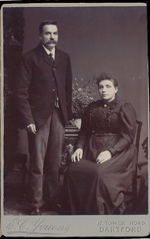 She married GEORGE BIDWELL (born abt. 1908). Lucy died in 1988 at the age of 87. G. LUCY MARTIN was born in Dartford about 1886. She died on November 24, 1912 at the age of 26. Do you know where he's buried? Yes, we do!